Nurturing talent is essential for an individual to go forward. In the world of car designers, though, some people have an inborn knack for creating spectacular machines. Today we’ll zero in on an up-and-coming automotive design crackerjack from Italy. His name is Gianfranco Spano and, according to his LinkedIn profile, the young fellow just got himself a degree in Vehicle Engineering at the Universita degli Studi di Modena e Reggio Emilia. To graduate from university, you need a thesis. Mr. Spano prepared one in the form of a design study. The 1:5 scale model in the adjacent photo gallery is the concept in question. Designed and fabricated with the aid of Modelleria Modenese and Carrozzeria Zanasi, the Alfa Romeo 6C is a design study for a road-going GT car. Carrozzeria Zanasi is in cahoots with Ferrari since 1964, the year old man Enzo was looking for a shop to repair damaged cars. These days, Carrozzeria Zanasi can prepare your Ferrari for Ferrari Classiche certification, provided that your car is over 20 years old. 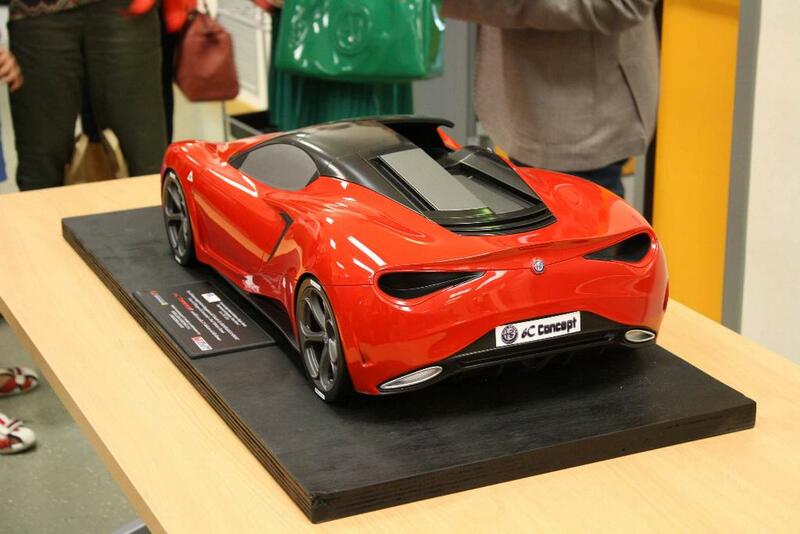 It’s rather clear then why Gianfranco’s 1:5 scale study looks so Ferrari-like, yet the badge reads Alfa Romeo. I’ll leave the photographs and renderings do the talking in my stead. What caught my attention the most, however, is the so-called Active Hidden Roof. The curiously called roof prides itself on no less than three possible configurations: Coupe, Targa, and Spider. It is still a work in progress, mind you. However, Mr. Spano intends to patent this system in the near future. Behind the driver’s seat, this magnificent concept theoretically hides the 510 PS 2.9-liter twin-turbo V6 from the Alfa Romeo Giulia Quadrifoglio. That’s essentially the 3.9-liter V8 engine from the Ferrari California T, with two cylinders lopped off for good measure. Last, but not least, I would like to mention an intriguing detail about this concept car. The Alfa Romeo 6C by Gianfranco Spano is said to ride on the backbone of the 458 Italia, sharing the same wheelbase and the front/rear tracks with the Prancing Horse. I admit there’s a whiff of McLaren 570S and Ferrari 488 GTB at the rear end and a lot of Alfa Romeo 4C at the side profile, but nevertheless, Mr. Spano deserves a round of applause for what he created here. Bravo, dear sir! Lucio Panicucci is a part-time car enthusiast, social butterfly and full-time Ouzo drinker. He also has the distinction of running Arctis.net which channels his very expensive hobby of collecting Alfa Romeo cars.